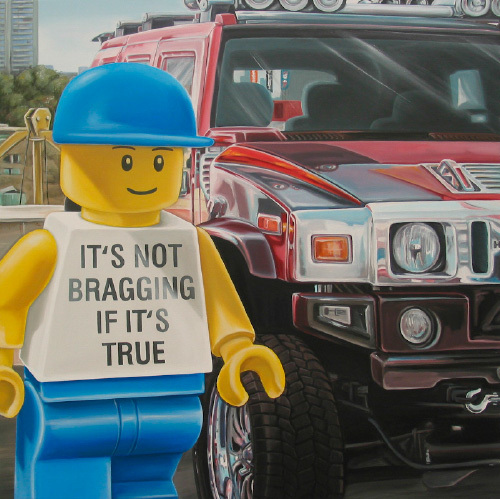 No Real Than You Are is an amazing avante garde, digital gallery of the artworks created by Leonard Ego. The realistically painted acrylics speak to the soul of the imaginary 21st Century. 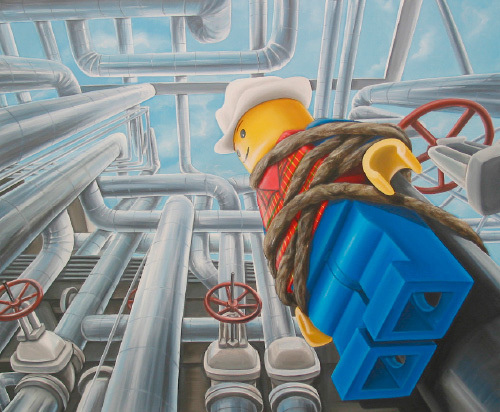 Dutch painter Ego Leonard paints pictures of LEGO minifgs that he IS. The enigmatic artist scours the deepest reaches of minifg explorer “virtual world,” ignoring questions that probe too deeply into the realities of modern minifigicity. The artwork is reflexive and rhetorical. Is the world we live in real? How did they come by their power? After the staged escapade on the beach, Leonard’s art was a self-reflection where he depicts himself exploring the world and encountering society’s hypocrisies and contradictions. 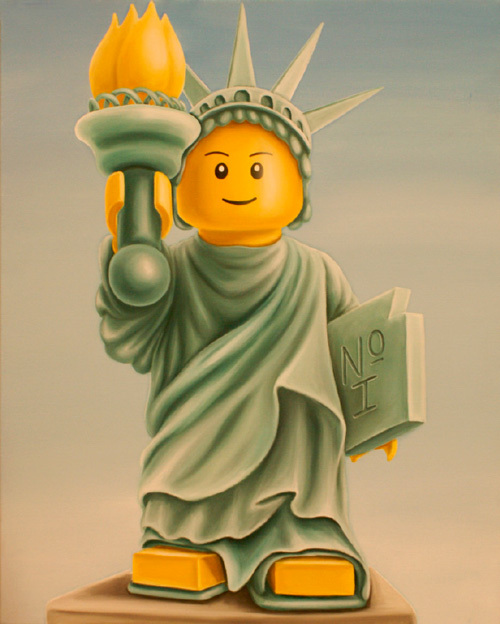 He is Dutch but his work is filled with Americanism and profound criticism of post-9/11 sensibilities, which are laced with alacrity. However such a clever fellow as Leonard doesn’t need all that attention. In fact, some art critics object to the statements Leonard’s artwork seems to be saying. When his fans argued that this seemed to be talking down to the 8 foot chap, Eye replied at length. Undeterred, Leonard’s supporters argued that adults seem to be ruining the world with their addiction to money. In the days of the old Spanish masters, painters painted to capture reality. Their tools were canvases and oils, and they masterfully stroked an illusion that captured either exact reality or commissioned hopefulness. 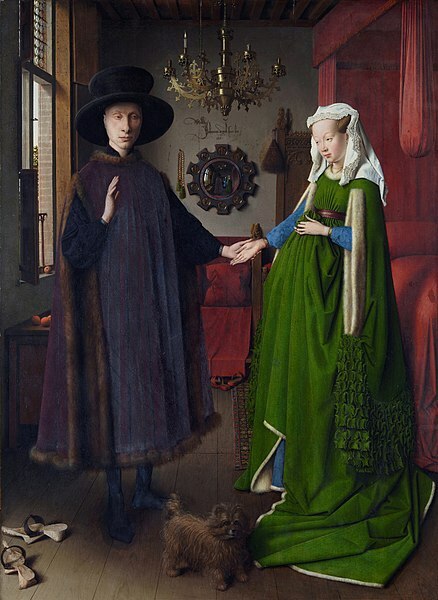 Back in the days when oils were oils, and that meant you had something to paint with – reality was more or less reality, if you turned a blind eye to the manipulations of Royalty. In today’s modern switched on connected world, “Oils ain’t Oils!” And nobody is sure about reality – real, imagined, virtual or otherwise. McLuhan claims the “medium is the message“, and Shakespeare claimed that “All of the wold is a stage“. 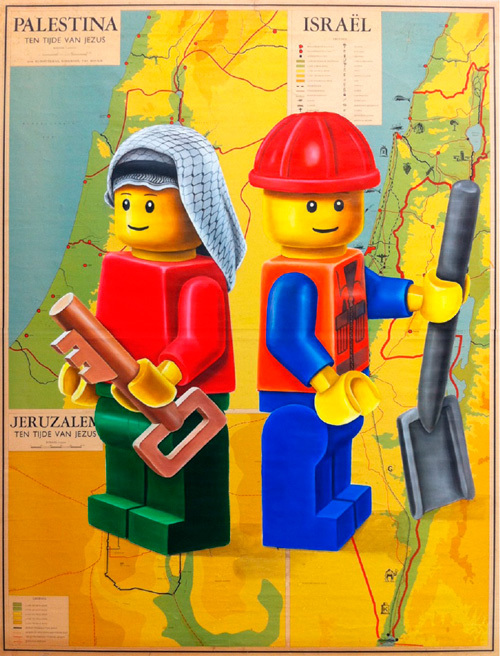 However Leonard might be proclaiming, not through the medium of Lego, but through the medium of Acrylic mimicking the play world of Lego, that time has come to find tools (extensions to thinking) that can deal with the mixed up double message of hyper reality and artificiality of layered hyper-reality. Leonard’s work can be interpreted from many levels. On the surface it is fun, and his depiction of Conceit could rival the best Batman movie for the “tied him to the railroad track”, appeal to overacted melodrama. On onother level, the questions he is asking represent a deep analysis of International politics. The break through, avante garde value of Leonard’s work is that he used a medium dear to the hearts of all gender and ages. The illusory artistic world Leonard has created is an entry point for children to begin their journey towards a personal aesthetic. It is also an entry point for teachers and gallery curators to dialogue with children about the serious side of art, while still apealing to ther sense of play. Baichtal,J & Meno,J. 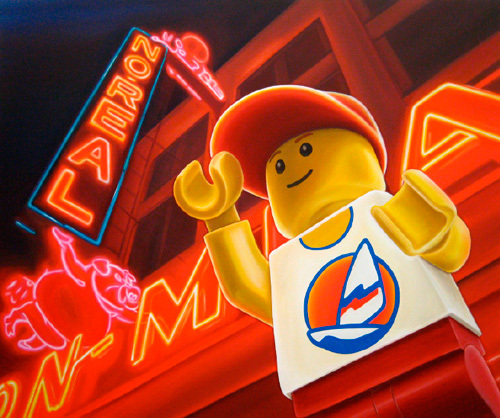 (2011) The Cult of LEGO. Safari Books. LEGO a Toy or a Serious Thinking Extender? 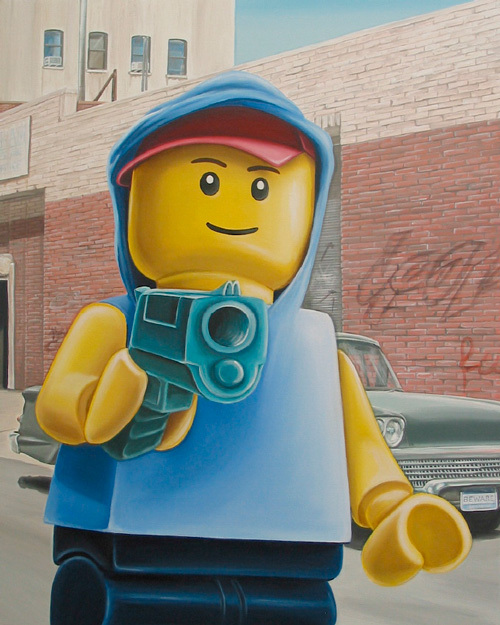 Quite impressed I am, for 1. that you found out about this guy and 2. that he is able to paint that well it looks real! With acrylics! I tried my hand at acrylics yesterday. All I accomplished was vague shapes. Not very detailed. Not very gifted at it yet. But, this guy, WOW! His paintings have deeper meanings than i’m prepared for at 4 in the morning but, so thankful for finding out about this guy! Rock on! none as of yet. sure not up for that challenge I mean, showcase yet! thanks though! will do, enjoy the day! perhaps legos are a part of your day today? haha.